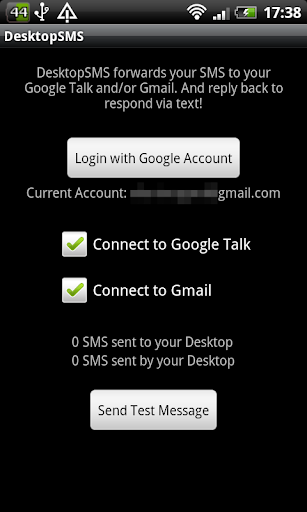 DesktopSMS is an Android application that forwards SMS messages from your phone to GMail or Google Talk. You can even reply to these text messages, either using Gmail or using your favourite IM client (it needs to support Google Talk). While replying to text messages via Gmail is as easy as replying to an email, using DesktopSMS with Google Talk makes it a bit annoying because you have to add each contact that texts you to your Gtalk. Also, when someone sends an SMS for the first time, Google Talk displays a pop-up to add that person as a friend, but the initial SMS is not displayed. DesktopSMS was created by the ROM Manger developer and is currently in beta. In my initial test, there was a delay when replying to text messages via Gmail, but this didn't happen in a later test. Still, this is currently in beta so you may encounter delays or other bugs, so use DesktopSMS at your own risk.